1. One of El Chapo’s lawyers who visited him frequently in jail: Oscar Manuel Gomez Nunez. Gomez Nunez previously represented at least one son of Chapo’s partner and co-leader of Sinaloa, Ismael Zambada-Garcia. More on El Chapo’s various lawyers here. 3. Two pilots and a mechanic. One pilot, Héctor Ramón Takashima Valenzuela, flew El Chapo from a makeshift runway in the village of Senegal las Palomas, San Juan del Río, Querétaro to Bastantitas, near Tamazula in Sinaloa, the night of his escape. (A van took El Chapo from the prison to the runway, where two planes were waiting.) The other pilot, Lanciani Romano Llanes, who was selected for the job by Hector Ramon, flew a decoy plane which landed to the South. It encountered a mechanical problem or missed the runway, and Hector called his brother, Julio César Takashima Valenzuela, who is an airplane mechanic, to go and fix it. More here. It’s not clear when the pilots were arrested, or if they were arrested at the same time. Mexico’s attorney general disclosed one pilot’s arrest to the Senate on October 8. The mechanic, Julio César Takashima Valenzuela, was arrested in July or August, according to his court docket asking for a writ of amparo (protection) which was denied. 4. Calixto Estrada Carrillo, the former owner of the property where the house containing the tunnel exit was built. He had owned the property since 1989. He was first arrested in July. Yesterday, he was released on bail. 5. Rigoberto Martinez Davalos and / or Francisco Ramirez Leon, who owed El Chapo a favor and “bought” the tunnel property from Calixto Estrada Carrillo, putting it in his name. He may have been imprisoned with El Chapo in the 90’s. 6. Burgos Araujo Lazarus. 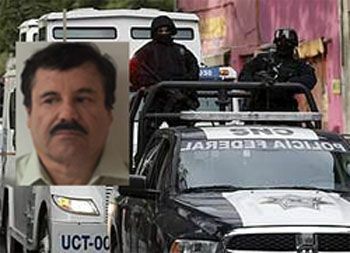 Some reports say he is the tunnel construction expert who is wanted by the DEA and allegedly constructed other tunnels at the border for El Chapo. He may have relayed the request from El Chapo to Davalos/Leon to put the tunnel property in his name. Other reports say he paid the construction workers. 7. German Valadez Estrada: A little confusion here too. He appears to be the person who negotiated the sales price of the tunnel property with owner Calixto. Some reports say he was in prison with El Chapo in the 90’s while other reports say Burgos Araujo Lazarus was in prison with El Chapo. Here’s an alternate version. Another name surfaced Wednesday: The man who allegedly paid for the construction of the tunnel and other escape costs. He is a businessman named Manuel Rodolfo Hernández Trillo, who owns restaurants, a money exchange, and is connected to a famous coffee chain called The Italian Coffee Company. The Mexican federal government continues to exert all possible efforts to deviate the attention from their responsibility in Joaquin “El Chapo” Guzman’s second escape from jail and from exactly how high the level of complicity goes in this case, by saying they’ve almost recaptured the drug lord and by holding press conferences to announce new detainees as they did Wednesday night saying eight persons that helped him break out of prison were detained. So it seems as though, as is customary in Mexico, that everybody but those who really profited and benefited from El Chapo’s escape, including those top-level federal government officials, will pay the price of cutting El Chapo loose once again. …there is no way only prison guards and officials are to blame for El Chapo’s second spectacular jailbreak from a maximum security jail. Disclosed Thursday: A pet monkey named Boots was key to determining his whereabouts last week. The story from the official investigation, according to this news report and this one: El Chapo gave “Botas” (“Boots”) to his daughters as a present before his Feb. 2014 capture. After his arrest, his wife and daughters and the monkey moved to an area near the prison to visit more frequently. A few days before his July 11, 2015 escape, his wife and daughters moved to Sinaloa and left the monkey behind. After his escape, the family was reunited and living together in a series of cabins in Bastantitas de Abajo, located in Tamazula, Durango. Pilot Héctor Ramón Takashima Valenzuela first flew Chapo to Bastantitas, and then separately brought Emma and the twins. Presumably, he was the one tasked with flying Botas to Bastantitas, but had trouble getting health papers for the monkey, and the monkey was reportedly transported by car. Police saw the monkey in Durango in a luxury Ford Mustang owned by Edgar Coronel Aispuro, and realized the monkey would lead them to El Chapo, so they decided to do a raid. 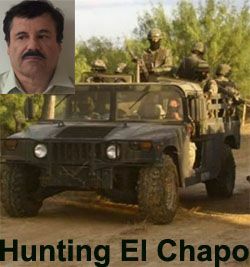 Although El Chapo didn’t leave Bastantitas until mid August, he was almost captured in Los Mochis in Sinaloa on July 30. After Bastantitas, there are reports he moved to El Limon, Tamazula in Durango, which is a village in the mountains of the Sierra Madre. This was where the Oct. 6 raid took place. Another village raided in Tamazula was El Verano. The raids in Tamazula displaced 1,000 people, who fled to Casala in Sinaloa. Residents of Tamazula say their homes were fired on. One house in the village of El Verano was hit by 33 bullets. Emma, meanwhile, may be back in Cualican — her house there was raided Thursday. Other houses raided this week include that of the wife of one of his imprisoned brothers (Miguel Angel Guzman-Loera) in Chapultepec, where some reports say one of his sisters is living. Miguel Angel has been in prison since 2005 when he was arrested at a family celebration for his daughter at a Chinese restaurant. He was at Altiplano recently with El Chapo, but was moved to another prison after the escape, as were several other high profile inmates. As to the prison officials, the head of SEIDO said a few days ago that the former director of Altiplano, Valentin Cardenas, and Cecilia Oseguera, the former head of Mexico’s prison system, knew of El Chapo’s escape plans and ordered unnecessary repairs to the prison to disguise the sounds of the tunnel construction. He said 34 prison officials and workers have been implicated, 29 of whom have already been charged and detained. He said whether they were threatened or not is irrelevant, because they could have reported the threats and escape plans and did not. He also said El Chapo personally put together his escape team shortly after his arrest in February, 2014.